Mulder Shipyard in the Netherlands recently received a new order from a Russian client, who has commissioned the construction of the first Mulder 95 Voyager. The exterior of this yacht is the brainchild of Frank Laupman of Omega Architects, while Vripack Naval Architects is responsible for construction and naval architecture. Construction on the hull will get underway soon, while the launch and delivery under RINA Class, are planned for the spring 2014. Built entirely in aluminium, the Mulder 95 Voyager will have a total length of 28.65 metres overall and a beam of 6.90 metres. The yacht will be equipped with two Caterpillar C18 engines, each delivering 1150hp and providing for a maximum speed of around 20 knots, a cruising speed of 15 knots, and a range of 3600 nautical miles at 10 knots. Coupled with a three-ton freshwater tank and a 166lph watermaker, this will allow the Mulder 95 Flybridge the self-sufficiency required to cross oceans. 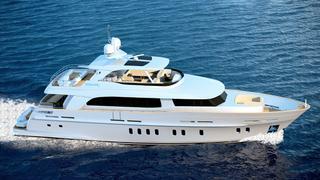 The yacht’s accommodation will comprise a generous master stateroom, including a large bathroom and a walk-in closet. There will also be a VIP suite and two guest cabins, each featuring a private bathroom. Crew quarters provide berths for up to four crew members. The first Voyager will be built in Mulder Shipyard’s new facilities in Zoeterwoude Rijndijk. Almost completed, the new yard will have enough space for the construction of yachts up to 45 metres in length and be home to the interior and stainless steel departments. The new yard is located just 15 minutes from Amsterdam Schiphol Airport, making it ideal for owners and their representatives. Frank Laupman of Omega Architects is currently developing three new Mulder Voyager yachts - the Mulder 84 Voyager, the 104 Voyager (which will have a master stateroom on the main deck), and a 114-foot model (planned as a tri-deck version).